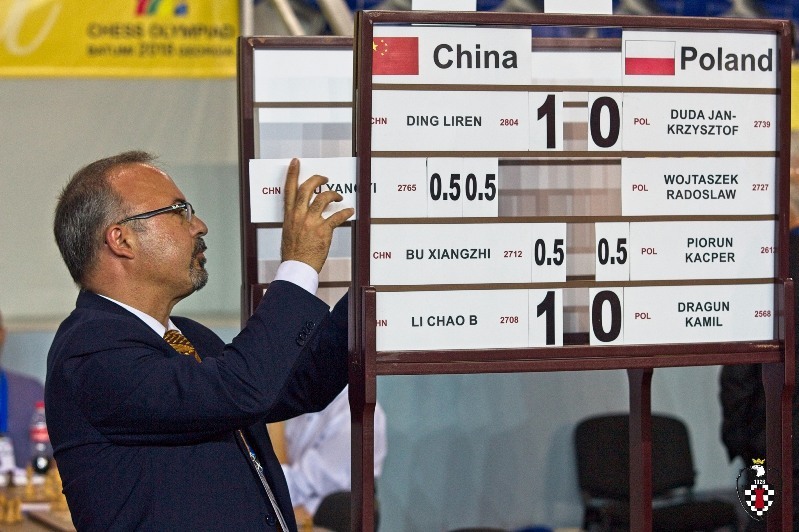 China and the USA meet in the last round in Batumi knowing that whoever wins will be the 2018 Olympiad Champions. China ended Poland’s brilliant run with a 3:1 victory that featured a stunning win for Ding Liren over Jan-Krzysztof Duda, while a single win for Sam Shankland was enough for the USA to beat Armenia. If the top match is drawn tiebreak madness beckons, with Poland, Russia and France all in with a shot of gold. In the women’s section China are the sole leaders, but in a repeat of Baku 2016 they face top seeds Russia in the last round. This is the last chance to take out a 1-year chess24 Premium Membership and get 3 months extra free by entering BATUMI as a voucher code - don't miss it! While that game was going China’s way it soon became clear that Wojtaszek-Yu Yangyi and Bu Xiangzhi-Piorun were heading for draws. That left Ding Liren-Duda, where the young Polish player had tried the sharp line that gave him victory over Wojtaszek in the Polish Championship earlier this year. Given what was happening in Dragun’s game he got the double-edged position he needed, but it was also more than he bargained for. This is the position after Duda’s 24…Qf6! Here 38.Bg5 was the final touch, and Black resigned. Ding Liren’s 14-month unbeaten streak continues, and if he can keep combining solidity with games like that then the sky, and by that we mean the World Championship title, is the limit. That result left England, the USA and Armenia with a chance to move level with China on 17 points going into the final round. For England the obstacle was the previously underperforming Russian team, and in hindsight it might have been good if it had been possible to play a replacement! That win turned out to be the only one in the match, after pressure from Ian Nepomniachtchi came to nothing. Shankland’s last move hits the b2-pawn, but that threat could have been ignored, or rather met with one of White’s own - 26.Bf1! Instead after 26.b3? c3! Melkumyan was pinning his hopes on attacking the light squares around the black king with his queen. He did manage to infiltrate the black position, but it turned out to be harmless, and when the dust settled Black was a rook up and Melkumyan had to resign. Ray Robson safely drew a position where he’d been better, so the USA won the match and now have it in their own hands to defend the Olympiad title they won in Baku. If they draw 2:2, however, it all gets much, much more complicated. First of all, three more teams can catch up with them – Poland, Russia and France. The French team had Laurent Fressinet to thank for defeating Hrvoje Stevic of Croatia on board 3 to score a vital victory. They now face Russia in the final round, while Poland take on India. If teams are tied for first the excitement needn’t necessarily end there! As in the previous Olympiad the first tiebreak isn’t the easy to calculate number of game points, but “Olympiad Sonneborn-Berger”, a number that is calculated based on the results of the teams each team has played in Batumi. In the penultimate round 7 of the top 8 matches in the women's section ended in 2:2 draws, with all 12 of the top 12 games drawn. 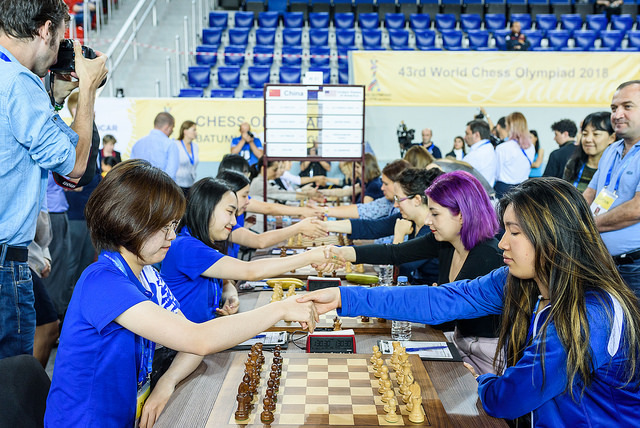 That gives no impression of the tension, though, with Ukraine-Russia a match in which no player dared to lose, while in China-USA Lei Tingjie tortured Tatev Abrahamyan for 114 moves before conceding a draw. So China are the only team to have their fate in their own hands in both sections, but they’ve ended up with the worst possible final opponents – or the best possible ones for us fans: top seeds Russia! 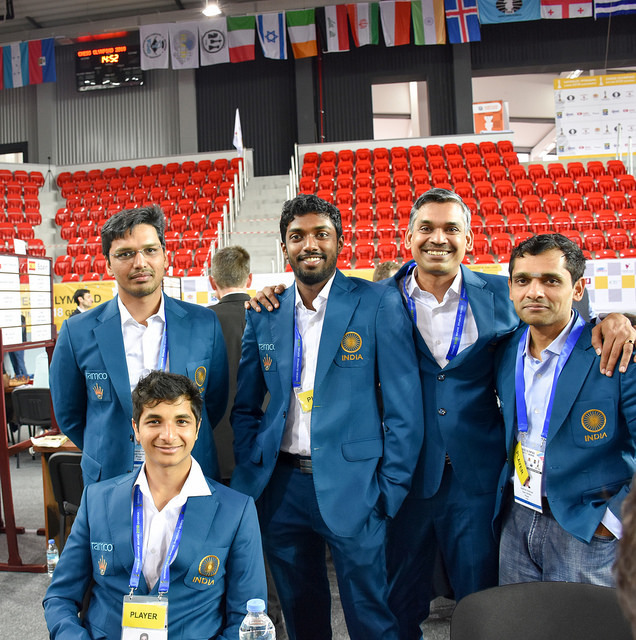 The Russian team trail China by 2 points and even victory may not guarantee them medals, but it would provide some revenge! 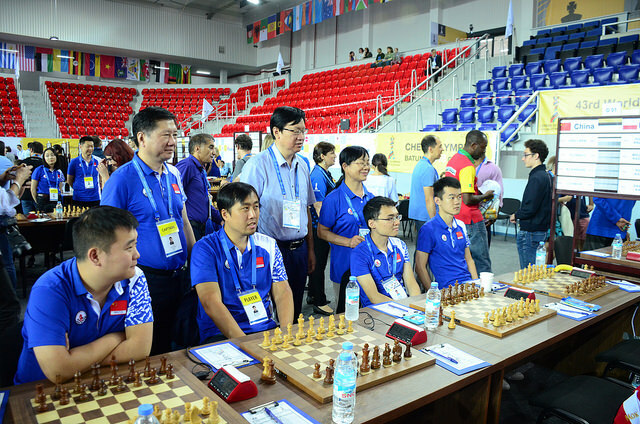 In the last round of the 2016 Olympiad in Baku the two sides also met, also with China leading by 2 points, and a 2.5:1.5 victory for China made them Olympiad Champions while depriving Russia of medals. It’s not just that match, with all to play for also in USA-Ukraine and Armenia-Georgia. Could the US team even win both sections?